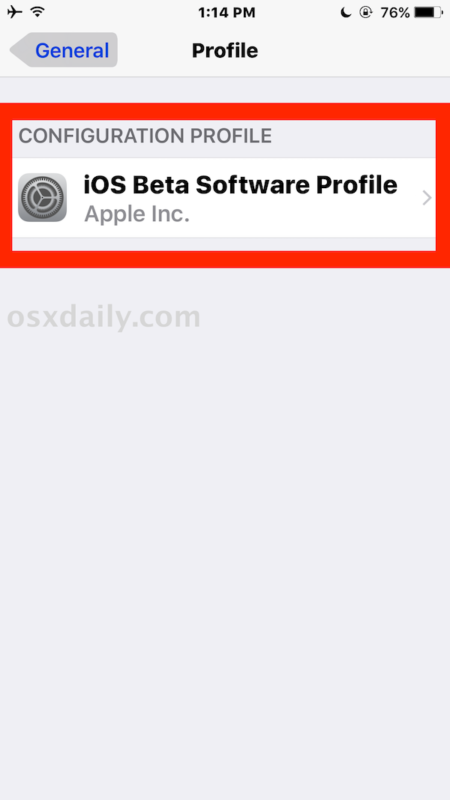 Installing an iOS beta onto an iPhone or iPad places an iOS Beta Software Profile certificate onto the device, which allows that hardware to receive new iOS beta builds through Software Update. 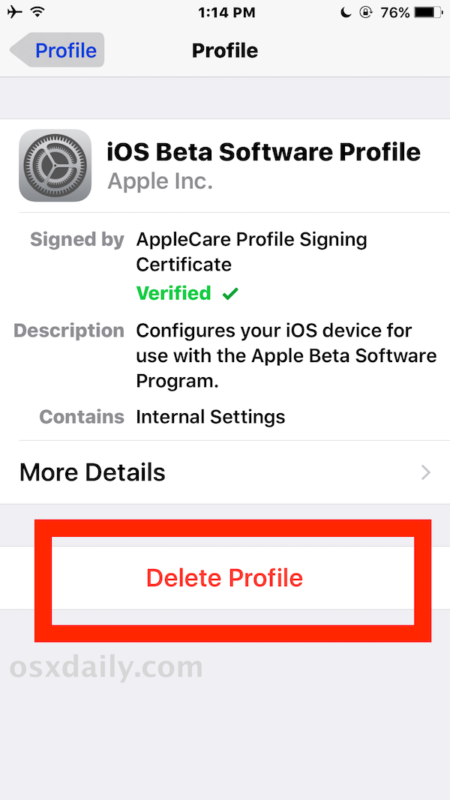 If you decide you no longer want a specific device to receive beta updates however, you’ll want to remove the iOS beta profile certificate from the device, which will effectively opt the device out of being in the beta program. 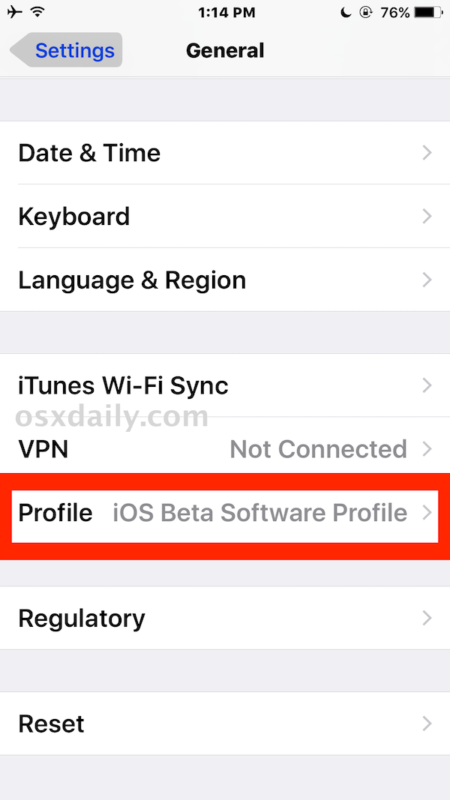 Keep in mind this is only removing the iOS beta software certificate profile from Apple, thereby preventing future iOS beta update builds to be available on the device, it does not remove the beta system software itself from an iPhone or iPad. If you already installed a beta release and want to go back to a stable build you’d need to downgrade, for example you can downgrade iOS 10 beta to iOS 9.3.x with this guide, which also has the effect of removing the downgraded device from the beta program. This is the same with both the iOS developer beta and public beta releases. Again, this prevents the device from getting future iOS beta builds through the OTA Software Update mechanism. This does not remove the beta iOS system software from the device, it just opts the specific iPhone or iPad hardware out of the beta release program. The only way to remove the iOS 10 beta is by downgrading back to a stable prior supported iOS 9.x release. Once the beta profile is removed, the said device will not get any future beta updates, unless the device re-installs another beta certificate profile from Apple again (these certificates are what allow anyone to install iOS 10 beta right now if they get their hands on one, but practically nobody aside from developers should do that for many reasons). If the configuration profile list says “No profiles currently installed” then all beta update certificates for apps and iOS have been removed, or there wasn’t one on the device to begin with. This obviously applies to the iOS beta releases, but Mac users can do something similar and opt out of macOS and Mac OS X beta software updates if desired as well. Confused about OSXD’s target audience. So much of their/your info is for developers only. Or am I misconstruing Beta talk as Dev talk only? This article is for anyone running the betas. But, OSXDaily at large is for a broader audience, and if you have an Apple device or use related software, you’re the target audience! We generally cover a broad range of topics pertaining to Apple, some of it is advanced and some of it is basic. Not everything is going to apply to all users, but that’s the nature of having a diverse focus area (not everyone has an iPhone, but may have a Mac, or vice versa, for example). Very useful, thanks. I installed the profile from a link, but then didn’t install the beta (didn’t want the bugs, chickened out!). I have installed iOs10 beta. But I have deleted the profile. Would I still be able to update iOs10 when it is released? Or do I have to downgrade first? Because what you said there was I wouldnt be able to update future updates if I deleted the profile. Beta versions are best reserved for developers and secondary hardware. Restarting my phone worked for me. Same thing happening to me :( I deleted the profile and am on 9.3.2 but ios 10 beta is still in my updates? Downgrade from iOS 10 to iOS 9, then delete the beta profile. That is what you should do. I’m running iOS 10 Public Beta 2 which looks way too stable(r) than PB1. In any case, I’ve had enuff and m done with the previewing. My question here is what if I keep Public Beta 2 on my phone…that is to say I DON’T DOWNGRADE, and still delete the Beta Profile on my phone, will I recieve regular updates (& not BETA’s) like everyone else does? What I intend to ask you is will I get the final release of iOS 10 software OTA? My phone tells me I’m running iOS 10 but it doesn’t say I’m running iOS 10 PUBLIC BETA 2. So will the final release of iOS 10 be available to me? Or will the iOS 10 already running on my device create a conflict the the new available version (whenever its out)? IN SHORT, do I need to downgrade to be able to install the final iOS 10 release? Is it essential? HELP? I installed TorGuard and I love it, but it now appears as my profile, so will deleting this profile take away my TorGuard service? I was happy to purchase this iPad with iOS 8, and don’t look forward to changing things because I understand the system the way it is. The ios9.3 auto downloaded, but I didn’t install. What is your opinion/advice? Thanks so very much. Does it delete any pictures or apps? I still receiving a beta update even though i deleted the profile of beta. what i need to do? I already downgraded my iphone to ios 9. Downgrade to the non-beta iOS then delete the profile to stop receiving beta updates. it deleted mostly all of my apps when I deleted the profile , but how can I get the profile back ? For those of you still having trouble with the beta update wanting to install even after removing the profile, the problem is likely that your phone has already downloaded the beta update. It appears that once your phone has downloaded the update, it will always want to install it regardless of the existence of a profile. If this is the case, simply go into Storage & iCloud Usage -> Manage Storage, select the downloaded update and delete it. Once you do that, the next time you force your phone to check for an update, it will find the official iOS 10 release. Awesome tip – helped me… thanks! Thank you very much! Worked like a charm! I had the beta on my iPhone 6s. When I got the iPhone 7 I never installed the beta to that phone. However the iOS 10 beta update showed up on my phone anyway. When I tried to delete the profile from the phone it wasn’t there. So I don’t have the profile on my phone but I’m still getting the beta updates. I don’t know what to do. I don’t want the beta on my phone. How do I get rid of it with no profile??? i need help getting rid of the beta updates on my daughters 5s. she received a link for beta updates from a friend and, as teens do, immediately installed it without asking her parents. she didn’t perform a backup before installing the beta updates and there is no “profile” option under settings>general, not sure why. therefore, i’m unable to restore a previous saved beta free backup nor am i able to delete the beta software profile. H E L P !! I am currently running a beta software on my iPhone 6s Plus and the software constantly messes with my iPhone. To the point where I can’t open messages or all my photos disappear but in storage settings it says I still have 35.55 gb of photos and videos. And I am fearful that with removing the beta it will remove my photos, apps or contact information. Will any of this happen if i remove the beta? I tried that but is it still says UPDATE TO IOS NOW. This update has screwed my iPad up. Can’t even use it!! How do I delete it? HELP! can anyone tell me if I delete the profile then will it install any ios version itself of any downgrading process will have to be done ?